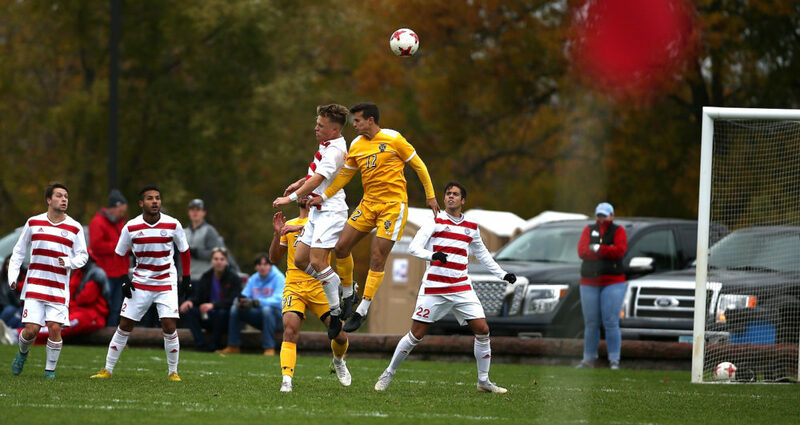 COLLEGEVILLE, Minn. – The Gustavus men’s soccer team erased a 1-0 deficit Saturday and outlasted Saint John’s in double overtime, winning 2-1. The Gusties extend their unbeaten streak to nine, paired with a five-match winning streak, improving to 10-1-1 overall and 6-0-1 in the MIAC, which keeps them on top of the league standings with 19 points. Saint John’s scored its lone goal of the match in the 12th minute and carried a 1-0 lead into halftime. In the 55th minute, Luke Laurich (Jr., Batavia, Ill.) knotted the score at 1-1 with his third goal of the season. Matt Gibbons (So., Minneapolis, Minn.) crossed from the right side, finding Laurich who connected on a header into the left side of the goal. The Gusties outshot the Johnnies 8-4 in the second half but couldn’t get one past the keeper and the match was sent to overtime. Gustavus played on its heels for much of the first overtime as the home team outshot the Gusties 4-0. But Gustie keeper Anders Severson (Sr., Woodbury, Minn.) was up to the challenge by making every stop. Finally, in the 106th minute, Trace Dobson (So., Sioux Falls, S.D.) crossed a pass into the box, finding Arthur Parens (Sr., Wayzata, Minn.) who benefitted with an open shot in the center of the net for his team-leading seventh goal of the season. Gustavus finished the game outshooting the Johnnies 19-16. Severson made eight saves. “They have only conceded one goal in the second half all season. So the reaction was perfect,” Flintham said. “We couldn’t be prouder, but again our focus has to shift to recovering and getting prepared for another big game on Monday. The Gusties next host Saint Mary’s at 4 p.m. Monday. Former Gustavus men’s soccer coach Larry Zelenz (standing far left) spoke with the team after their 2-1 win at Saint John’s.